Parenzana was the name of a narrow gauge railway that used to run from the Istrian coastal city of Poreč up to the port city of Trieste in Italy. Built in 1902 during the Austro-Hungarian Empire, this railway was 123 km long with 35 stations and a steam locomotive that used to transport passengers as well as freight. The railway got its name from Parenzo, the Italian name for Poreč. One of the towns with a station along this train line was Završje, a once flourishing commercial centre which went through a decline once the railway was discontinued in 1935 during Italian rule, and eventually almost completely abandoned. 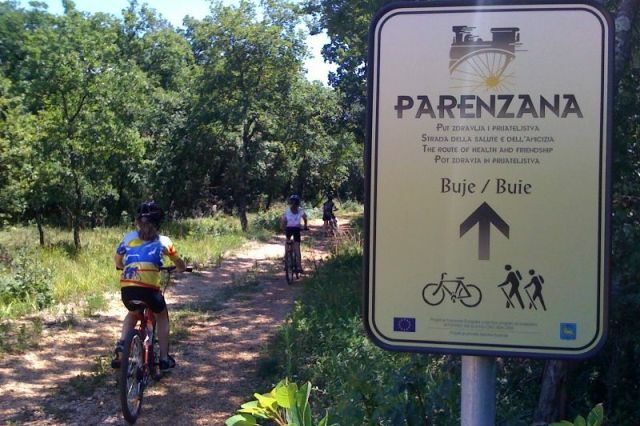 Today this former railway line has been transformed into a popular and very scenic cycling and hiking route that winds its way from Croatia through Slovenia and on to Trieste, just like the steam locomotive once used to. P is also for pomalo! Very nice to go through the recent post, can one have a budget holiday at your place? Hi Srinivas, prices in Istria are lower than many places in Western Europe, especially outside the peak summer season (July and August)!